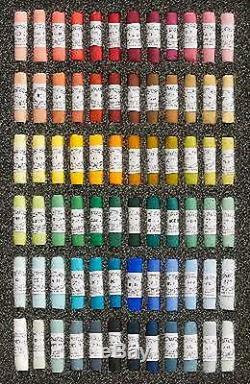 PRODUCT : UNISON ARTISTS PASTEL SET - 72 STARTER. DESCRIPTION : Unison Soft Pastels are second to none in the subtlety and intensity of colour, their fluency and responsiveness to touch, and in their delicacy and robustness. Unison Colour hand-made pastels aspire to perfection. These colours have stood the test of time and are very durable and light-fast. This set of Pastels is securely packaged in a heavy cardboard box with protective foam inserts. Red 12, Red 11, Red 10, Red 9, Red 8, Red 7, Red 13, Red 14, Red 15, Red 16, Red 17, Red 18, RE 7, RE 8, RE 9, RE 10, RE 11, RE 12, BE 30, BE 29, BE 28, BE 27, BE 26, BE 25, Y 12, Y 11, Y 10, Y 9, Y 8, Y 7, Y 1, YGE 12, YGE 11, YGE 9, YGE 8, YGE 7, GRN 12, GRN 11, GRN 9, GRN 8, GRN 7, GRN 1, A 43, BGE 12, BGE 11, BGE 9, BGE 8, BGE 7, BG 6, BG 12, BG 11, BG 9, BG 8, BG 7, BV 12, BV 11, BV 10, BV 9, BV 8, BV 7, Grey 28, Grey 30, Grey 32, Grey 34, Grey 35, Grey 36, A 49, A 50, A 51, A 52, A 53, A 54. The item "Unison Artists Pastel Box Set 72 Starter Colours" is in sale since Tuesday, December 28, 2010. This item is in the category "Crafts\Art Supplies\Drawing & Lettering Supplies\Art Pastels". The seller is "bargainartistshop" and is located in Stafford, Staffordshire. This item can be shipped worldwide.